FAQ Elaboration: Is My Story Speculative? If you write science fiction or fantasy, you’re usually confident about where your work would be shelved in a bookstore. Fantasy? That’s dragons. Science fiction? Spaceships. Dragons on spaceships? Now you are “cross-genre”. But if your work does not happen to contain dragons nor spaceships, it isn’t always as clear where it might be shelved. Surely any fiction is “speculative”! What does it mean in the context of the Merril Collection and this contest? The Merril Collection of Science Fiction, Speculation and Fantasy collects “science fiction, fantasy and speculative fiction, as well as magic realism, experimental writing and some materials in ‘fringe’ areas such as parapsychology, UFOs, Atlantean legends etc.” Broadly, fiction that includes any element which has not yet been found in the real world is speculative. But behind that is a complex history of the fantastic in literature that defies easy classification – all of which can be found in some form in the Merril Collection. From St. George and the Dragon to Fafnir of the Volsungs, the Greek Titans to the Mabinogion’s Bran the Blessed, and unicorns from Pliny to Marco Polo, early literature is full of fantastic things. These original tales are not generally thought of as “fantasy”, however, though contemporary retellings are. The difference? Early dragons, giants, and unicorns were presented in earnest. 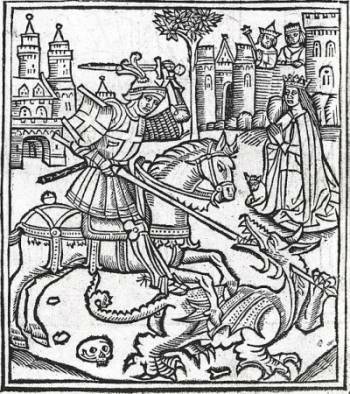 Even if they were not always meant to be taken literally (the dragon slain by St. George is, probably, an allegory,) they were not invitations to the imagination. The stories and their monsters were to be taken seriously. What does this mean? Interpretive retellings of myths and legends are definitely speculative – but the inclusion of religious symbols is not. Whatever you think about today’s big religions, they are not considered fantasy from a literary standpoint. Fairy tales, on the other hand, were and are considered flights of fancy. These “little stories” were always intended to light up the imagination for the purposes, usually, of entertaining us. Despite being muddied from time to time with superstitious folk beliefs, a fairy or folk tale is distinguishable from a legend by an explicit statement that it takes place in another world, be it “once upon a time” or “in a land far, far away”. What does this mean? Fairy tales, folk tales and retellings of both are definitely speculative! We have always been fascinated with the unexplained. There is a great shady area in literature (and life) where unexplained phenomena are hashed out. Ghosts, cryptozoology, near-death experiences, parapsychology and a lot more are still taken quite seriously by some, and lumped happily into “folk tales” by others. Is it real, science fiction, or fantasy? Because the paranormal is unproved in real life, any fictional accounts are going to necessarily be speculative. What if this ghost were real? What if everyone had ESP? Whether you consider paranormal elements to be true or fantasy, your story will need to invite the imagination to turn it into a narrative. There are holes to fill, and you will fill them. What does this mean? Unless you are writing a non-fiction manual or treatise, paranormal elements are absolutely speculative. If you believe in them, your account will be science fictional. If you don’t, call it fantasy or horror. Either way, you had to make things up to make it work! Magical realism is a term given to stories where something wondrous or fantastic happens in an otherwise mundane setting. It is different from urban fantasy in that even the inhabitants of your world find the magical elements to be out of their world. There tends to be an aesthetic to magical realist novels that is distinct from conventional “fantasy” – an acceptance of magic in every day life without trying to explain or systematize it. What does this mean? Though magical realist novels are often exempt from the fantasy shelf at the bookstore, they are still considered speculative by us. If your characters consider it magic, so do we! Weird or slipstream fiction invites the imagination in ways that defy conventional genre categories. The imaginary elements might be more inherent to the world than in a magical realist novel, but they also aren’t presented with nonchalance the way they would be in a secondary-world fantasy. Aesthetically, weird stories can be creepy or off-putting, as strange and unexplainable things appear in order to unsettle us and/or the characters. What does this mean? Is there something about your characters or the weird phenomena which is mis-matched because it simply isn’t found in the real world? It’s speculative! You don’t even need to be able to put a name or face on the phenomena, as long as it is otherworldly. Horror is broadly anything which is scary, but that can cover a lot of territory, from war and death to ghosts and monsters. You might be very creative about putting your characters in mortal danger, but that doesn’t always mean it is speculative. Simply being horrifying does not make a story speculative. What does this mean? If your horror element could happen in the real world – however unlikely – it isn’t speculative. Cannibals, serial killers, extremely creative engineers of death-traps, kidnappers and sadists – these are messed up, but not otherworldly. Monsters, zombies, alien invaders, invented diseases and parasites: these are made up, and therefore considered speculative. Whenever you write history, you are writing an alternate history. You weren’t there, so what you are writing probably didn’t happen the way you are going to tell it. Historical fiction has been a huge genre since Sir Walter Scott and even earlier, but has never really been considered fantasy or speculation. On the other hand, historical fiction that tracks wildly from the path history is generally understood to have followed becomes more and more speculative. The more your history deviates from what “really happened”, the more speculative it becomes. What does this mean? If you are at the point where your historical fiction has to invent new technologies, nations, social orders, cultures, or major figures in order to account for the changes you have made to the timeline, you are well into speculative territory. Think of it as historical science fiction! We can dream up anything. That’s what we do here, that’s what this contest celebrates. The raw imaginative power of dreams is often a theme or device used in speculative fiction – see Neil Gaiman’s Sandman for a case in point. But a story whose speculative elements occur entirely in the context of a dream and have no connection to the story’s “real world” is not a speculative story. What does this mean? In short, if there is any possibility that the dream world is any more than “just a dream”, it is probably speculative. If a character wakes up at the end of a flight of fantasy and nothing carries over, it probably isn’t. When in doubt, query! But if after you have read through all of this, you still aren’t sure where your story stands, it is probably speculative enough for us. Submit and see what happens! You have a little less than three weeks left – we hope to hear from you! We have been open to submissions for two months now, with one month to go! Submissions have been strong so far, but we have a ways to go. Our submission numbers are up 15% – we’re nearly two weeks ahead of where we were last year. Queries and website traffic are up as well, thanks to posts on Gawker, io9, and Jezebel. While most of our submissions are from Canadians, we have representation from the US, the UK, Brazil, and Spain. But don’t be discouraged – your odds of placing in the Contest are still very high! Our slush pile isn’t as deep as those of most pro ‘zines – and, of course, you can submit to them simultaneously. We would love to see more international submissions, more submissions from women, POC, and members of the QUILTBAG community. We strongly encourage those unique pieces you worry won’t fit anywhere else. We are a open and welcoming Contest with a great love of work that challenges us! Want to see what your donations are doing? Come on out to some of the Merril Collection’s upcoming events! Award-winning fantasy author Nnedi Okorafor discusses writing and fantasy at the Merril Collection of Science Fiction on Thursday, March 5, in the lower level, Lillian Smith branch, 239 College Street, starting at 7PM. The Friends of the Merril Collection and FilkOntario are co-sponsoring the 3rd Annual Filk Festival, Music for the 21st Century. Music will be created in the lower level of the Lillian Smith Branch on Saturday, March 21, starting at 7:00PM. Fantastic Pulp Show. The event will feature ‘golden age’ pulp magazines from the 1920s – 1960s. A lecture on pulp art will take place in the 3rd floor reading room of the Merril Collection at 1:30. The pulp show will take place in the lower level of the Lillian Smith Branch, between 10:00AM and 4:00PM. Call 416-393-7748 for further information. So submit soon, and submit often! The contest closes on Sunday, February 15th, 2015. We look forward to reading you!